Cassandra Dean is here sharing the latest in her Silk Series, Silk & Scars, a sweet historical romance from Decadent Publishing that is out now! Cassandra Dean is a best-selling, multi-published author of historical and fantasy romance. Her latest novel, SLUMBER, is part of Decadent Publishing’s Beyond Fairytales and features Cassandra’s take on Sleeping Beauty. 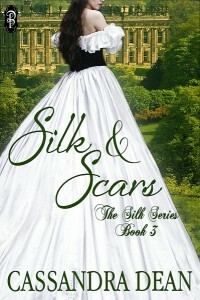 Her next novel, SILK & SCARS, is part of her popular Silk Series, featuring Victorian Era lawyers and their happily ever after.